Abstract — As discontinuous, fiber-reinforced composites have limited fatigue and creep resistance, PlastiComp, Inc. investigated outcomes of selective, structural-reinforcement of injection-molded samples. Unidirectional, continuous fiber inserts in tensile and compressive regions of structural parts were insert-molded with long fiber thermoplastic (LFT) compounds. It was found that the load to fatigue life of one million cycles was increased from 50 to 70 percent of the material strength. The use of long fiber thermoplastic (LFT) composites is well documented . Although continuous-fiber reinforcement remains the ideal, the normal instances of complex-shaped parts preclude the use of continuous fibers, as there are limited methods of placing these fibers in complex geometries. Secondly, cost-effective and standardized manufacturing methods such as injection molding limit the use of continuous fiber reinforcements. Therefore, discontinuous, or chopped fiber is the dominant fiber-form. When using discontinuous fibers, the fiber content, fiber length, and its aspect ratio and fiber-orientation become the dominant variables. Long fibers ensure that load transfer from the matrix to the fiber is not limited by the available fiber surface-area. As the pultrusion process used in the manufacturing of LFT pellets or granules can be easily adapted to make unidirectional tapes, it was decided to make this new form and use them as continuous-fiber inserts in high-stress regions of LFT injection-molded parts. The process consists of first, consolidating the resin-impregnated fiber strands in a rolling mill and eliminating the pelletizing or granulating stage. These unidirectional tapes were characterized for physical uniformity and fiber content. The tapes were typically 0.25 mm thick and the width (12-50 mm) was selected to match the tensile and compressive surfaces, initially in 12 mm wide ASTM test-bars and later, in injection-molded parts. In initial experiments, standard ASTM tensile test-bars were injection molded with tape-inserts on their flat surfaces. Table 1 shows the increase in strength and stiffness of tensile bars, insert molded with tapes on both surfaces. The tapes were made from 68 weight percent carbon fiber in polyamide (PA) 12 resin. The tapes were inserted in an ASTM test-bar family tool and over-molded with 40% long carbon fiber PA66 compound. Both surfaces of the molded test-bars were reinforced with the tape inserts. Next, the tape-reinforced test bars were creep tested at room temperature. Figure 1 shows the difference between tape-reinforced test bars and ordinary test-bars. Figure 1: Room temperature creep of LFT test-bars insert molded with reinforced tapes. Plane-stress conditions of injection molded parts often consist of surfaces in tension and compression that are connected with ribs or similar structures. An I-beam is a good representation of these parts, wherein one flange is in tension and the opposite flange undergoes compression. Therefore, it was decided to mold an I-beam with tape inserts on the flange surfaces and subject it to flexural fatigue in a 3-point bend test. Figure 2 shows the test set-up. An injection-molded I-beam, 203 mm in length and 25 mm high was used, where the span-length was 190.5 mm. The fatigue load was varied as a percentage of the strength of the I-beam material (40% long carbon fiber PA66). The flexural bending test was conducted at 15 Hz, a frequency suited to the application and because higher-frequency (2-25 Hz) testing represents the most severe flexural fatigue case . Figure 2: (A) Injection molded I-beam in 3-point bend testing and (B) tape insert in as-molded I-beam. The results show that LFT compositions have fatigue life times of 1million cycles or higher for stresses below 50% of the material strength. For stresses greater than 50% of the material strength, there was a rapid drop in fatigue life. In the tape–reinforced, I-beams the fatigue life of 1 million cycles or higher was extended to 70% of the material strength. Figure 3 displays the results. Figure 3: Fatigue life increase in 40% long carbon fiber PA66 composites with tape inserts. LFT composites are limited in applications when creep and fatigue load conditions become important. Conventionally, metal inserts are used to satisfy stiffness, creep, and fatigue requirements. However, a metal-polymer matrix is more fraught with the risks of mismatched phases at the interface. It is especially true of insert-molded parts, where differences in thermal expansion lead to high residual stresses at the metal-polymer interface. Although mechanical pinning is often used to combat differential shrinkage at these interfaces, the use of unidirectional fiber-reinforced polymer inserts is a better option because of thermal compatibility. Initial studies (Table 1) show an increase of 11 percent in tensile and 25 percent increase in flexural strengths, respectively. The flexural properties show a pronounced increase because of the tape-insert on the tensile-surface of the I-beam, and when the continuous fiber reinforcement takes up the flexural load. 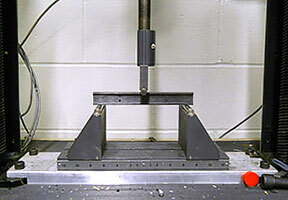 Tensile or flexural strength is always limited by failure in the surrounding LFT material. The tape inserts never fractured, leading to the suppression of catastrophic failure normally associated with LFT composites (Figure 4). Data is consistent with other studies when normalized to the fiber-content, thickness of the unidirectional plies or the total number of plies used as inserts [3, 4]. Figure 4 also shows the parabolic increase in tensile strength with insert ply-thickness or the total number of plies used, and is based on a systematic study conducted by PlastiComp. Figure 4: (A) Tensile strength vs. number of inserts (0.25 mm thick inserts; glass fiber weight fraction: 68%) and (B) failure in tape-insert, injection-molded test-bars is in underlying 30% long glass fiber PP material. the tape holds fractured halves together suppressing catastrophic failure. Microstructural studies of the failure mechanisms under creep and fatigue conditions are currently underway and will be reported in future publications. Preliminary failure analysis points to crack propagation and failure in the LFT material that surrounds the unidirectional insert. The improved creep and fatigue properties shown in Figures 1 and 3 made it possible to meet in-use specifications for composite parts that are under constant bending loads of 1,560 N, with peak loads of 3,560 N and are warranted for 40,000 cycles at frequencies of 8 Hz or lower. Since these parts are a breakthrough in metal replacement in the outdoor sports industry, customer confidentiality restricts the display of these parts. Nevertheless, they can be visualized as 660 mm long I-beams, where the I-beam flange width is 25 mm and the height of the I-beam is 90 mm. Because of the additive properties of tape inserts, tapes of varying fiber content and matrix polymer are currently in testing for load-transfer between the polymeric matrix and unidirectional fibers, failure mechanism and mechanical properties. Initial study indicatse that the tensile strengths of unidirectional tapes is only 20% that of the reinforcing fibers. 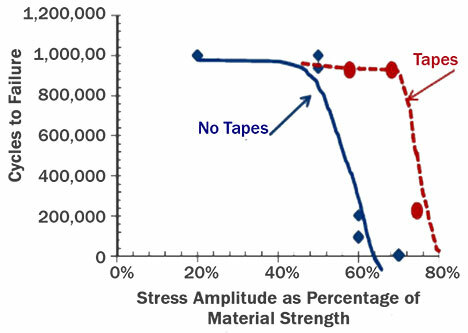 This loss in tensile strength should be correlated with load-transfer mechanisms in tape-testing and the standardization of tensile testing of 0.25 mm thick samples.